Some Social Media Experts I respect recommend limiting how many you follow on Twitter. I respectfully disagree because I am not a buckle bunny. If someone is not interested in interacting with me why would I follow them? Or put them in my TwitterFeed? And if I am not following them I won’t see what they share and they have lost me as a source of having what they Tweet shared there or anywhere else. Yes, I know that you can interact with someone even if they don’t follow you – and that many do just that – but why limit your followers now that you can organize them using Twitter lists? just the conversations you are interested in. Twitter allows us to create up to 20 lists and follow as many lists others have created as we wish. You could put your friends in one list, your closest collaborators in another and your woodworking buddies in another. Or you could have all your gardening friends in one, your co-workers in another, and your blogging buddies in another. Click a list to see only the tweets by the people on that list. Lists are very easy to use. You can probably figure them out all by yourself, but just in case you run into difficulty finding them or using them here are screen captures for both the original and new Twitter layouts. You can go step-by-step or if you get stuck just look for the image that looks like the screen you’re on for details. If you click on lists you will see the create a list function and a lists following you option. Simply give your list a name and a description and select public (to let others use your list) or private (so only you can see it). As always if you can’t figure this out you are invited to Tweet to me @GrowMap, leave a comment in this post or use the contact information on the contact tab. I am always happy to assist. I invite you to #followfriday the Blogging Buddies list that should include all of the current awesome members of the Secret Blog Club. Members need to know that our forum went down the first time Murray Newland’s blog did. Murray’s blogs were moved to a new server, but the forum is still down. I sincerely hope it comes back up or he can at least get me a copy of what was in it so it can be resurrected somewhere else. P.S. The reason Twitter lists can increase your influence is that they allow you to follow everyone who follows you and still hone in on Tweets by your favorites. The more lists you are on, the greater reach and influence you will have because many use Twitter lists to find new people to follow and to see who others believe are influential. Want some excellent tips on how to use Twitter? Read Jeremiah Owyang‘s How to Use Twitter. Must admit to being in the older generation (62) so although I do have FB; G+ and Twitter accounts I still haven’t really caught up with social media yet and wasn’t aware of the “create lists” option on Twitter. This is a very informative post. Have made a note for myself to set aside time later to read again and check out the other posts you linked to. What do you do about spammers, the girls with bikinis on and no bio so you don’t know who they are or what they do and somehow they’re following you? Do you block or block and report or put them in a separate list and ignore them? And do you follow them back? After one day on Twitter I had some 50 odd followers, about 3 of them were genuine. Please advise on this etiquette. Great article too, thanks, you’ve really helped me. If I can tell for sure they’re spammers I block and report them. When I can’t tell I just ignore them. I do use the auto-following tool Social Too so sometimes I end up following them, but if I notice them spamming I block and report them and if I don’t notice usually eventually Twitter deletes their accounts. Either way end of problem. User names with numbers in them, suggestive photos, specific types of tweets, or an account promoting all the same links are giveaways that they may be spammers. I recommend doing what I do – focus on what is good and ignore what isn’t. They aren’t worth our time so just create lists for the tweets from the people you want to be able to focus on and use them regularly. It looks like Twitter may be selling, creating or protecting some of these spam accounts which I explained in a post about possible Twitter Spam Income. The way to be successful is to always focus on whatever is the next highest priority. Have you seen the post I have that contains links to everything from How to Get Started on Twitter videos to advanced strategies? That post is Twitter Best Practices. growmap would love you to read ..Are You Playing Hide and Seek With Your Market? I’ve glanced over several twitter guides but I’ve never seen the lists function covered before. Perhaps this is an indication that most of these people never get enough followers to need lists and should not be listened to in the first place. What do you do about the “infomercial” and/or multilevel marketing type followers? I generally block them. Should I keep them instead and put them into a “spammer” category or something? When you follow many people you don’t really see their tweets much. There isn’t really any reason to put those whose tweets don’t interest you in a list; lists are for those you DO find interesting so you can tune into what they have to say at will or at least as time allows. I only block people if they go out of their way to be annoying unless they’re spammers. Those I report if they are foolish enough to spam me. How do i get unlimited “following”? currently my twitter only allow 2000 “following”.. If you click on the link that tells you that you can not follow any more people it should have taken you to information about Twitter Following Limits. It can be very challenging to get beyond the 2000 limit. You basically have to unfollow those who don’t follow you in order to follow those who will. Why Twitter doesn’t realize that the reason for following and unfollowing is their silly limits. Even after you get past 2000 there are still limits. You can not follow more than a set percentage over the number who follow you. I agree that if you have good number of followers then it would be very advantageous as well. What I realized that in short period Twitter grew up much and it is mainly due to business stuff…. Twitter lists have become a way to organize my followers and to keep a handle on conversations as well. 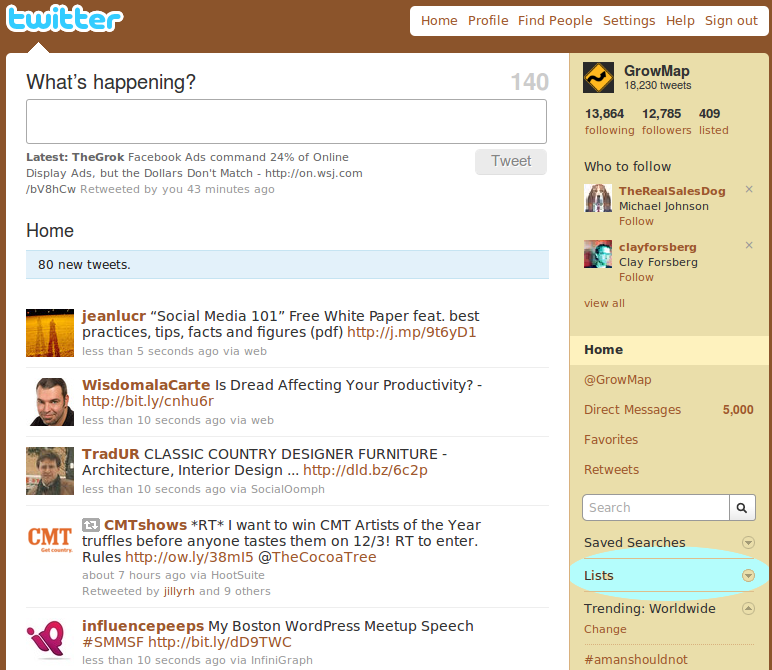 I also use Hootsuite, which allows you to add streams (another type of lists). I use my Twitter Lists but change them up frequently so I can connect with, read blog posts, retweet, etc. from my lists. Not only does this help me stay in the know, it also helps my Klout score. As someone who believes in sharing information it helps my followers as well. I agree, list can be a great way to get noticed on Twitter. I have created a couple on a unique profile and both have many very targeted followers. If you can think of a profile for your clients and create a list of interest to them, they will follow the list and you at the same time. This also helps you appear as an authority in your field. Tip: publish one or multiple posts on your blog about your list(s) using the list “theme(s)” and title(s). That way you will get followers to the list via your blog for people using Google to find people to follow on twitter. Gail, believe it or not, the lists thing is just confusing enough (the way Twitter explains it) that I just played with it instead of seriously using it. I’m going to study this post and see if I can’t get a better understanding of it. Where does this fit in with 3rd-party list utilities like TweepML? I find that one to be very easy and you can mass edit the entire list. After reading this post, I realize twitter lists are a powerful method to increase traffic to your blog. I will start using the list and see how it goes for me. The influence on twitter can benefits you in both campaigns that in SEO and SEM. You can get benefits of traffic as well as marketing. Wow what an awesome post Glad I stopped by really just missed you. I always advise others to do the same. If you look at my Twitter stream you’ll see I’m not big on chatting and I’m never lonely. I simply don’t believe in class differences. I don’t fawn over the rich and famous and don’t think I’m too good to talk to others and to me that is the message I get when I see someone only follows their click and ignores everyone else. I prefer to work with those who desire to be my peers and let those who want to set themselves apart find other sheep willing to follow them silently. We agree there for sure. I’m just sayin’, if you had the mojo I was looking for, yet weren’t all that chatty, I’d still follow you…at least until I found someone with the same mojo who was also interested in chatting. I remember when twitter first introduced the list option, I created one just because it was new, but I didn’t really understood how to use it or what is it’s purpose (aside from the obvious one of partitioning your follower after your criteria). After reading your post and some of the comments I an now going to make my own lists, maybe this time I’ll find a useful use for it. Cool tip and very useful, of course tweetdeck users had groups option which basically did the same thing. Interesting stuff, I just now looking into Twitter to see if its worth joining, just can’t seem to grasp how it all works yet, it seemed simple but now i realize it’s bigger than i thought. Of all the Social Networks, I believe Twitter is the one every blogger or business or Web site owner should use. It is simple, most people can use it, and it provides an alternate, low stress method for people to contact you. I make extensive use of lists to better keep track of my interests segmented in various niches, like social media, tech news, 3d news etc. It’s mostly painful to go through the live Twitter feed, and you don’t have time to sort out relevant Tweets all the time, lists help you in just this. They are also awesome to find potential new people to follow, for example, I like to check the lists people added me to, ’cause most of the times it means I am paired with similar people I might share interests with. Thank you for mentioning that important tip I left out – that the lists you are added to are rich sources of people you don’t know who are likely to be in your niche! I regularly discover entire communities of other thinkers like me that prior to that discovery had no overlap with anyone else I know. As we “meet”each other our reach multiplies. Love your new post about promoting blog posts. I sincerely believe that promoting is more important than posting every day. If you can’t do both focus on promoting existing content first. This is a great post and very insightful. Until recently I actually kept my personal Twitter lists down below 100. I found it too hard to follow people and truly understand what they’re talking about and what they represent as an individual, but recently I threw that out the window so I could grow my own personal brand and I agree lists are the way to manage various people. You have to remember as well though, not only do they serve this awesome purpose of managing your followers but they can serve as a jumping on point for the people who follow you as well. I am so glad to have you as a regular reader and commentator. I would love to reach far more business owners and introduce them to influential bloggers. I see supporting small local and online businesses as the solution to our declining economy. Those who understand that will escape at least some of the worst of it. Lists have definitely changed how I use Twitter, as they do help me sort out a lot of the “noise” of everyday conversation. Thank you for coming by regularly and commenting. I do follow you at Twitter and congratulate you on recognizing the value of Twitter lists early on. I wrote this post for those who aren’t as comfortable jumping into something they don’t know and also to share tips on how to use them more effectively. I find the Twitter Lists very useful, having a list for favourites and other lists enables me to follow those that I am interested in without getting to mixed up via the normal twitter feed. Poeple like us have so many people we keep in touch with and follow that lists are essential. Even better, we can use the lists of people following Blazing Minds and those you follow to quickly find others. Gail, I’ve been thinking a lot about Twitter lately and how I’ll make the best use of it. I started using lists early on and they have been very helpful to me. When someone follows me, I look at their profile, their recent tweets, and their website. If they are legit Twitter users and are not doing anything I consider unethical on their websites, I follow back. Another good reason to follow back: If you don’t follow back, that person may eventually unfollow you, and then you lose your chance to influence him or her to spread your message, comment on your blog, buy your stuff, etc. You are completely correct that if you don’t follow back that eventually the most active Twitter users are likely to unfollow you. That is because when they hit the artificial following/follower limits and we must unfollow someone we use tools that tell us who doesn’t follow us and they are the first to go. Thank you so much for taking the time to share your expertise and wisdom with my readers. I believe your interview would be a good addition to the How to Make a Blog eBook and I will ask Murray to include you. I could not agree more. Used to be careful following too many people but since the lists have been introduced I am following anyone who seems to be human and real. It is the best way to treat people – that is all. Very nice tutorial too! I will be recommending it to clients. I agree. I think having a tons of followers and only following a few back sends the message “I am better than you” and I don’t want anyone to feel that way about me. Your clients are fortunate that you make the time to share what will benefit them. Do people really analyze thinks that much? of course because of the lists you might as well follow every real person that follows you. But if they unfollow you because you don’t follow them, then they weren’t there for your tweets in the first place.